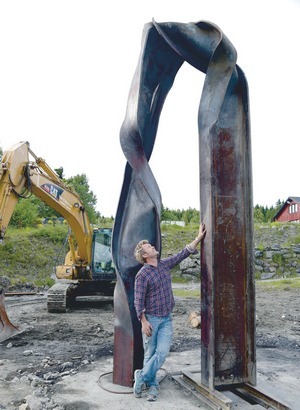 Magne has recently been working on a unique steel sculpture, commissioned by Norwegian billionaire Kjell Inge Røkke. 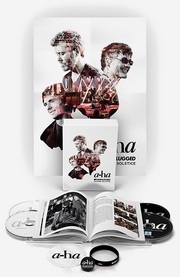 This is the third major art project Magne has done for Røkke during the last year, he has previously decorated the headquarters of Aker Solutions at Fornebu and created the Code 1 sail for Røkke’s luxury yacht Aglaia. This time Røkke wanted a spectacular steel sculpure, resembling a tree, which would eventually stand outside his luxury cabin at Oppdal. To create the sculpture, Magne decided to twist and bend a 12 meter long and 2,5 ton heavy H-beam of steel, something which has never been attempted before. Magne has been preparing this project since late 2012, and enlisted the help of two blacksmiths and one excavator driver in the process. To get inspired, Magne took his team on a trip to Bilbao and St. Sebastian earlier this month, to study the works of Spanish sculptor Eduardo Chillida. Last weekend, the final process of twisting the H-beam started. The newspaper Budstikka has a long article documenting the project (including a slideshow) on its website, which can be found here.